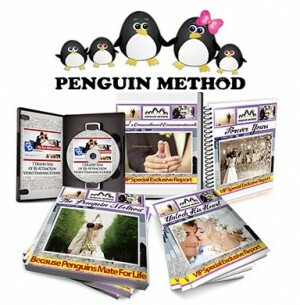 In this Penguin Method review, I will give you my unbiased opinion about Samantha Sanderson’s Penguin Method PDF Book. It’s a popular dating program for women. Penguin Method program is created by Samantha Sanderson. Samantha is a popular dating coach & expert. The goal of Penguin Method is to “chemically alter a man’s brain to instantly adore and commit to you forever”. Does Penguin Method work? Or is Samantha Sanderson and the Penguin Method a SCAM? Let’s find out in this Penguin Method review. Quick Links to Penguin Method program. → Download Free PDF Report. So lets jump right into this Penguin Method review. Here’s some general information about it. Cost: Less than $50 (click here to see lowest available price). 1) The Penguin Method Complete Program. 2) 7 Deadly Sins Of Re-Attraction Video. 4) Unlock His Heart Exclusive Report. 5) Forever Yours Exclusive Report. Let me break down the six parts of the program. The Penguin Method Complete Program. This is the main program. It contains all the worthwhile upfront content. 7 Deadly Sins of Re-Attraction Video. Cupid’s Commitment Commandments. Unlock His Heart Exclusive Report. Forever Yours Exclusive Report. These four items appear to be short reports and videos created to promote other products. In my opinion, they are not worth $47-$67 each as listed. In fact, I’ll send most of them to you myself for free. The Love Of His Life Community 2-Week Free Trial Membership. There’s a free 14 day trial to The Love Of His Life Community. After that, it costs $15.43 per week billed monthly. So expect to be charged $67 for the next month of access to it on day 15. You can opt-out of the trial. Uncheck the box next to it before checking out. Then you will not receive the free trial, but you also won’t be charged later. You can also cancel the subscription prior to the trial end. Then you won’t have to pay for it. Is Penguin Method’s The Love Of His Life Life Community a scam? Is it worth the money? I’ll tell you in my Penguin Method review conclusion below. 1) Penguin Method has lots of content. 3) Cute concept with some sound advice. 1) In my opinion, the “bonuses” are mainly just ads. 2) Monthly subscription program is more per month than main program. 3) A bit disorganized in places. I thought the advice was really good. Samantha does a good job of explaining “man logic”. She explains how to manipulate it to make a man commit to you. I used the Penguin Method on my boyfriend. I found it highly effective. For weeks he was planning to watch the Super Bowl with his guy buddies. They were going to drink beer, eat pizza and probably fart a lot LOL. Instead, I got him to watch it with me instead. He even brought me organic strawberries and my favorite dark chocolate. After the game, we snuggled and watched the series finale of “Parenthood” on DVR. I credit the advice of Samantha from Penguin Method. Buy it at the lowest offered price by clicking here. I like to be fully honest and bring any “cons” to your attention. In this case, my biggest issue is with The Love Of His Life Community. The entire Penguin Method program is less than $50. But just one month of The Love Of His Life Community is $67. It reminds me of a coupon I had for a Gillette Venus Embrace razor. The razor shaved my legs great and was cheap, but the replacement blade refills were a whopping $4 each. The Penguin Method is offering their main program at a low price because they make their real money with the monthly community fees later. There is an easy fix to this. You can cancel your community membership any time before the 14 day trial is over. Send an email to support [at] penguinmethod.com requesting to cancel. Then you will not have to pay the monthly fee. You can also uncheck the check box to the right of where it says “The Love Of His Life Community Free Trial Membership” prior to checking out. You will not receive the free 14 day trial. But you also do not have to worry about being billed later for it. I personally did not find the community worth the cost. It seemed mostly like promotions for other products. But it’s probably worth trying out the free trial. Just remember to cancel it if you don’t think it’s worth the money. Here’s the adorable ad I clicked on to order Penguin Method. If you like, you can click on it to order it or watch the free video. In conclusion of this Penguin Method review, I do recommend purchasing this Samantha Sanderson book & pdf. Especially if you have problems with guys not committing. Just be careful with the community membership though. No Penguin Method review would be complete without a star rating. I give Penguin Method 4 stars out of 5. Get your copy here. So what do you think of my Penguin Method review? Agree or disagree? Share your Penguin Method review below.